MADISON - Marie Helen Garness was born Sept. 22, 1939, in Fond du Lac, the only child of Hart and Cecilia Urban Garness. As a child she studied music, playing the piano and cello. Her favorite was the trumpet, playing along with Harry James and Louis Armstrong records. She spent long happy summers on the family farm in Wild Rose, playing alongside her many cousins. She graduated from Goodrich High School in Fond du Lac, in 1957, and came to Madison to attend the University of Wisconsin. She was president of the Alpha Chi Omega sorority and was involved with music and theater on campus, working for several years on Humorology, the student-produced comedy review. For Marie, being a teacher was not her job, it was her identity. Her first assignment as an English teacher was at Central High School in Madison. She considered it one of the happiest times of her life. Recently she attended a reunion of some of her Central High students. When Central closed in 1969, she transferred to West High, and then to Memorial High School, where she taught until her retirement in 1989. Everywhere she taught, she loved working on the staging and directing of musicals, working until she was exhausted on productions of Mame, Annie Get Your Gun, Pippin and many others. She brought her love of musicals and films to the classroom and introduced film units into the high school English curriculum. When she retired, Marie could still remember the name of almost every student she had ever taught. She adored movies of all kinds, but was especially fond of musicals. She was a long time devoted Judy Garland and Liza Minnelli fan. She loved crossword puzzles, cooking, gardening, basking in the sun, reading, especially mysteries, and floating in her swimming pool. She loved meeting new people and figuring out what made them tick. She enjoyed travel, though it was difficult for her, and had made several trips to New York City. She had planned many trips including the South Carolina sea islands and even China and Africa, but was never able to go. Marie had endured breast cancer and very proudly wore her seven year survivor pin. Her numerous friends, former students, fellow teachers and dedicated medical providers will remember the best things about her: the intense spark of her creativity, enthusiasm and wit, her generous nature, and her compassion and concern for others. Marie suffered her entire adult life with bipolar depression and other aspects of mental illness. Over time her illness made her world smaller and more difficult, made relationships with friends and family increasingly difficult, took away her ability to do things she loved and burdened her daily life with numerous obstacles. After a life long struggle with mental illness, she ended her own life on Sunday, Aug. 12, 2007. Many who knew Marie have said that they feel guilt or regret for not being able to help her, wishing they had done more. A fitting tribute to Marie would be to channel those regrets into something positive by helping out as you can, do a kindness for a friend, a neighbor or even a stranger. Friends, colleagues, and former students are invited to share in the celebration of Marie's life on Wednesday, Oct. 3, 2007, from 4 p.m to 6 p.m. at the OAKWOOD RETIREMENT CENTER - WEST, 5205 Mineral Point Road. Please enter the main entrance of the Heritage Building. 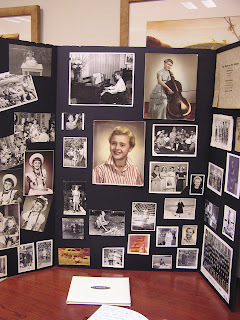 The photo on the left is a photo of some of the many photos of Marie's life and career as a teacher than were on display at the celebration of her life. I'll be adding some more photos from the display, as well as some photographs of some of the people who attended the celebration to the Central Alumni Flickr account. Here I am, 43 years later, writing something because of Marie Garness. The former time is vivid for me. Sophomore year. I wrote a piece on To Kill a Mockingbird, and I tried to do more than "enough", I tried to excel. Marie read it, perceived what I was trying to do, and told me I owed it to myself to work at my writing, but then she went a step further, as only she could have. She said that if a I wrote a journal, she would too, and we could compare. I was amazed and inspired – a teacher inviting me into the adult world, treating me as an adult, and expecting me to rise to the situation. I have no idea how many times I have told this story to people I have met, to give them an idea of what wonderful teachers I had, and Miss Garness was one of the best. The times a bunch of us just stopped by her house on a Friday or Saturday evening…uninvited, just to say hi. And she invited us in, sat and talked, and treated us as she would any friends who stopped in. the play, where she was a central pivot of the whole team, teaching us the joy of creation, of teamwork and hard work, and the satisfaction of a job well done. Marie, standing in row 3, yelling "entrance stage right! ", gesturing up at the stage in the old, dusty, brown auditorium. Marie on stage, playing jazz on her trumpet, with Mr. Schenk on the piano. Shocking us all that teachers could be so COOL. Marie laughing in her living room, at one of Sid Iwanter's routines. …and Marie talking with us all a the reunion and picnic so recently, helping us retain a link to who we were 40 years ago, and maybe helping us see who we are now. But even more, we need to remember the life she lived, and the lives she touched. Thanks, Nadine, for this obituary. It was very well written and interesting. I pulled out my 65 Ty, which, thanks to you, I keep in my cubicle, and looked at her picture (page four), as I read it. That way, I kind of remember her, even though I never had a class from her. If I had, maybe I wouldn't write all of these run on sentences with so many commas. When she said that Central days were "some of the happiest days of her life" I started to think back, and compared to the way the world has become, I'd have to agree with Miss Garness and say they were some of the happiest for me, too! Remembering all of her students names, also, impresses me. It shows that she was a wonderful, caring person in this sometimes cold and impersonal world. Bravo! Miss Garness! I was very surprised to hear about the bipolar problem as she always seemed very upbeat and positive to me. High School students can drive you batty and maybe we did that a little (or a lot) at Central! Sorry, Miss Garness. I will always remember you as a great lady!! May you rest in peace!!! After reading Sue Brockett's essay, I had to write another comment. I believe that Miss Garness was in charge of most or all of the plays that Central did when we were there. And, I would like to say that even though I was a football, basketball, and baseball guy, I still liked to watch our plays. I don't think that the participants and especially the director, Miss Garness, ever really knew how much guys like me appreciated those play, especially ones like "Cheaper by the Dozen" and "The Mouse that Roared", I think it was called - and others. It would be nice to read some more comments from classmates about those plays! Nadine: Marie Garness did travel to China because we were on the same flight to Beijing in 1998. Don't know why I didn't introduce myself. Saw her name on the tour passenger list. I was sad to hear that Marie Garness had passed. It was all about her students, giving them space to flex their talents and dreams. Stagecraft was her passion. A group of us once stopped by her house on Stevens Street. She gave us cake, and had a little kitten as a roommate. In my yearbook she wrote, "Keep thinking big." It's not true that she never traveled to China. We were on the same flight to Beijing in 1998. I noticed she had given up wearing high heels. Her name was on the tour passenger list, so I'm positive it was her. I don't know why I didn't introduce myself during the course of that trip. I will never forget Miss Garness.